This week has seen the start of turbulent times in the British Isles. The future, especially for science is looking uncertain. What can I write about to distract myself? How about the biggest black hole in our galaxy ? What if I throw ina whole star that’s about to skim the surface at 1/40th of lightspeed. ‘Cause that’s what’s about to happen. For those of you that aren’t up to speed with galactic geography: In the centre of our galaxy is a monstrous black hole, that astronomers call ‘Sagittarius A*’. It weighs more than a million solar systems, is bigger than the orbit of Neptune, and probably grows by eating other black holes. It’s so powerful that, when it really chows down on something, the radiation produced as a by product can influence the evolution of life on Earth, 26,000 light years away. 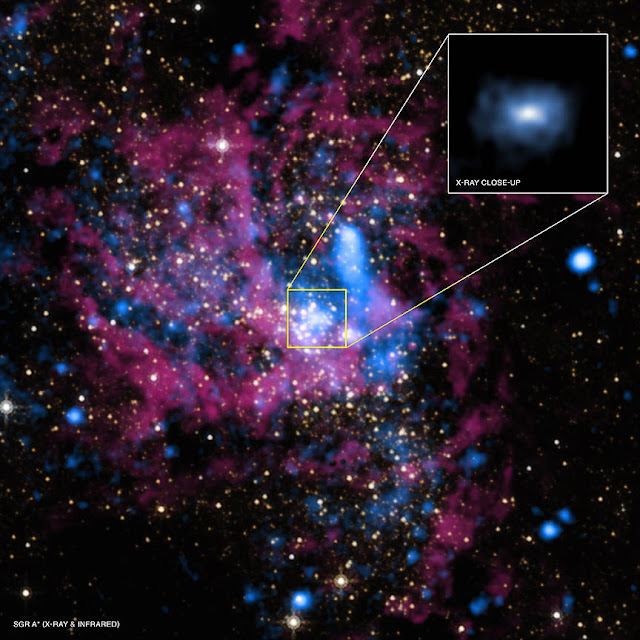 Above: The region of the giant black hole, and an X-ray close of of the area closest to it. Above: A quick run-down on the Event Horizon telescope. Orbiting this monster is a collection of stars, gas clouds, and (presumably) smaller objects down from brown dwarfs to space dust. Recently the star ‘S2’ has been imaged by the new GRAVITY interferometer, which will be able to track it more accurately than ever before. That’s important, because S2 is in an orbit around the black hole that takes it to within spitting distance (alright… 17 light hours) of it’s point-of-no-return, the event horizon . As it falls towards the black hole it picks up speed, until it is travelling at more than 200 times the speed of our fastest space probe. It will tear around the black hole, close enough to have the hole loom large in the sky of any planets along for the ride (there almost certainly aren’t any, but that gives me an excuse to throw this picture up). Above: An artists impression of a world orbiting close to a titanic black hole. There aren’t many tests of our theories of physics – especially the theory of general relativity – more extreme than close observation of an event like this. Watch this patch of (extremely hazardous) space, there could be some serious discoveries coming out of it.